Two Bears Farm and the Three Cubs: Farm Update - Eats from the Garden! Farm Update - Eats from the Garden! Time has gotten away from me - I've been meaning to do a garden update for a while now. Each week I take new pics and each week time slips away from me. So here is a post with the results of a few weeks of good home garden cooking! 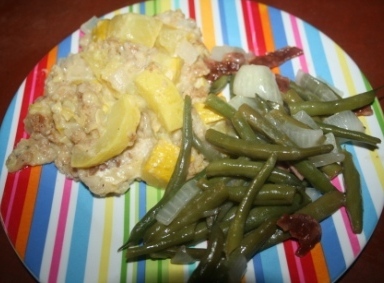 WV Treasure's yellow squash casserole with German green beans - both from the garden. The most gorgeous pie I'd ever seen. Took me forever to make it but I couldn't believe when I took this green bean and mushroom pie from the oven. It's so pretty. Unfortunately, the boys didn't like it. But I love green beans and got to eat it mostly myself. 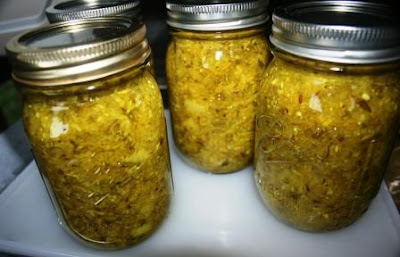 Sweet yellow squash pickles. The type you marinate in the fridge for four days then dig into. So good! 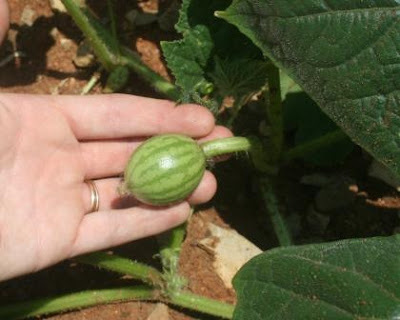 In the garden we've got teeny baby watermelon. I hope these little guys keep growing! 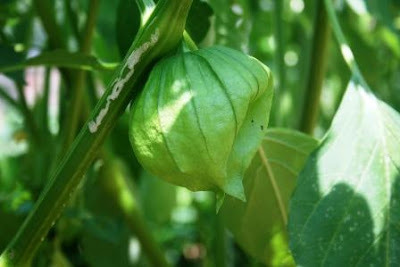 Tomatillos on the vine. Inside the husks they are still small, so they also have lots of growing to do. This fellow was ready to eat. I made scalloped turnips - just adapted a recipe for scalloped potatoes. 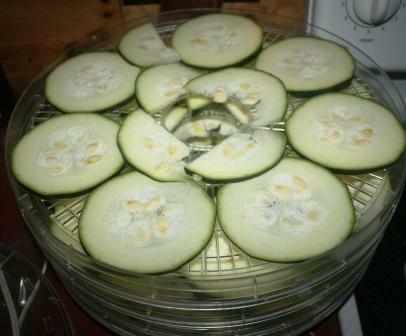 And I've been putting many zucchini in the dehydrator. They make wonderful chips if you lightly salt them before dehydrating. Marinated veggie kabobs for the grill. Zucchini dill relish (thanks to the Texan for the recipe!) which is incredible on hot dogs, sandwiches, and burgers. Even the boys adore it. Love how drastically my grocery bill was cut this month, thanks to all this garden goodness! And since I'm talking about the farm, I'll just quickly update you on the chicks too. We have 5 chicks now (one got eaten by a black snake when it was small). The chicks are in the awkward teen stage. Two of them have these rebellious mohawks going on. What next? I'll go out to find them in leather jackets with wallets on chains, won't I? I hope your animals are behaving themselves today! Rebel chickens and truly beautiful pie. You have a lot going on! Zuchini chips sound actually quite delicious! HaHa! That teen chick is a riot. Your pie really was beautiful. Glad you are enjoying the fruits of your labor. The pie looks like a work of art! 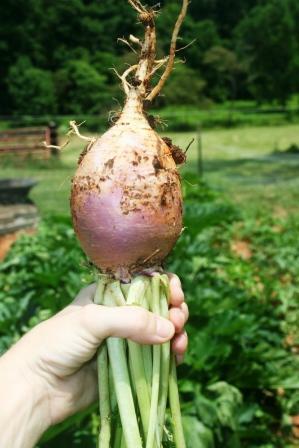 Love squash, and turnips. Have never scalloped before; great idea!! Your garden is looking so good, and it is so cool that your grocery bill was lower too. Now you just have to find a way to keep those teenagers in line! I love your garden and animal posts! That pie does look beautiful! And tasty! I continue to be amazed by all your energy! Planting, canning, dehydrating, cooking from scratch, the three little ones, it makes me tired just thinking about it. But It must be because you are a runner and so healthy! The food looks so good, especially the pie! The chicken is a real sight, looks a bit like he's molting! Yum, Lisa! Everything looks so delicious! That pie is picture perfect! I LOVE all foods from the garden! Haha! That chicky-mohawk is funny! Such yumminess! There is nothing better than homegrown veggies! You shocked me on the pie! I thought it was an apple pie at first! Maybe the boys did too! All of those vegetables look incredibly good, as do the different recipes!!! I hope that your watermelons get HUGE because I LOVE fresh watermelon!!! Your garden produce looks great. 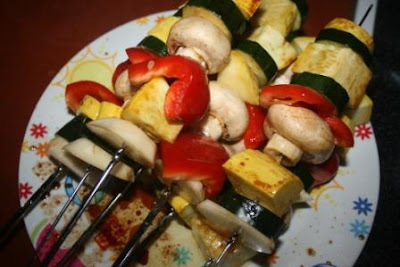 I will have to try that with our zucchini. I like to shred our zucchini and then squeeze the water out with paper towel or cloth. Then mix with bread crumbs, egg, spices and fry like a salmon (or tuna) pattie. Very tasty. I am starving now after seeing your beautiful veggies! That pie turned out perfectly. I've always wanted a dehydrator; you have peaked my interest in one again! Love the chicks - they are bad dudes!!! Ooh. I love this. I might need a dehydrator now. 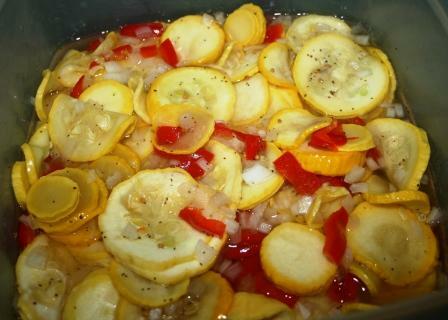 And the sweet yellow squash pickles look yummy. How do you handle working, twins, animals and COOKING? I have too many animals, twins (older) and I still don't do the cooking very well! Gotta work on that. Looks like your garden is doing great! Those are some cute chicks! all of your garden eats look amazing! my mouth is watering :) wish we had better soil...and me lots more time...to garden here. you're just a few hours from me, i'm in the hampton roads area. :) and just started following you. sweet little guys you have too! The green bean & mushroom pie looks really good. I might have to try to make that soon! looking forward to hopping back over! 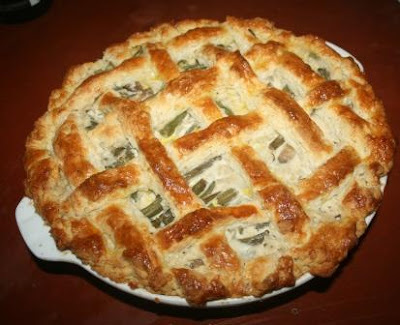 That pie looks amazing..I'll give it a try soon to use up the excess green beans! I LOVE green beans from the garden. And that pie looked awesome! None of my kids would have eaten it either. And that baby watermelon was so cute!! I. Am. So. Jealous. I miss a big garden. But hey, if I behave, will you post that zucchini dill relish recipe? 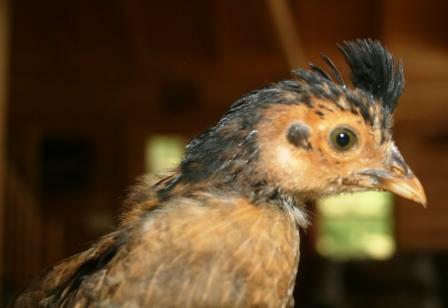 I like your punk rock chicken. :) Just got your comment on my blog; did you order Cornish Cross? I imagine it will be getting cooler by the time you get them out of the brooder, so you're probably okay. We would have ordered chicks earlier in the spring if we could have, but who knew we'd get this terrible heat wave?? Your green bean pie looks so yummy!! And all that garden goodness has my mouth watering! I'm your newest follower.